Frost Cut has a durable matte finished edge. This surface is consistent from part to part and is resistant to fingerprints. 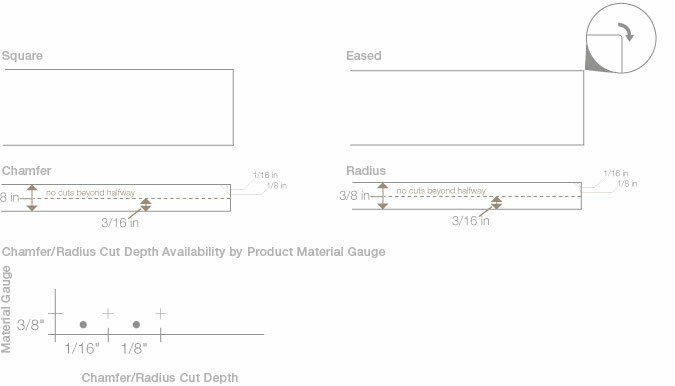 Specify nearly any 2D shape, slots, radii, and holes in most materials with a tolerance of 0.03". Standard 3form lead times apply. Polished Cut has a smooth high-gloss edge. The edge finish is consistent from part to part. Polished Cut is a very cost effective way to cut and polish shapes. Specify Laser Etch to engrave smooth graphics at ten thousandths of an inch depth. For installations where panel edges are exposed, upgrade from the standard saw cut edge finish. Several edge finishing options for Varia Ecoresin are available. Saw Cut - Standard edge finish. Sanded Edge Finish - 400 grit sand paper provides a consistent, brushed look. Flame Polished Edge Finish - Sanded finish plus a flame-applied glass-look finish. Solvent Finish - A solvent-applied finish that creates a satin appearance. When using Varia Ecoresin in horizontal surfaces like table tops or bar tops, or in vertical solutions such as unframed doors, consider 3form's edge detail options. In an installation where multiple panels need to be pieced together to form larger panels, choose from several flat seaming options for Varia Ecoresin panels. Tongue and Groove Seam / Tongue and Groove Reveal Seam - Offers the strongest structural support. Spline Joint – Use this for neutral light colors (especially white) with radius panels. 3form Fabrication offers two standard angled seams for box-like applications such as light boxes, showcase boxes, planters, countertop dropdown ledges and aprons, and return-to-wall panels. Varia Ecoresin is ready to be formed to meet your design needs. Formed Varia Ecoresin is perfect as decorative cladding for walls and ceilings or podiums. Formed Varia Ecoresin is a perfect sculptural element in any space. 3form offers a number of standard complex curves. 3form Varia Ecoresin can also be formed or shaped in almost limitless custom variations to realize your specific vision. For installations where panel edges are exposed, upgrade from the standard saw cut edge finish. Several edge finishing options for Chroma are available. Polished Edge Finish - Superfine sanded finish with 1200 grit paper combined with a polished buffing process. The result is a clear appearance with a soft sheen. Renewable Matte - 220 grit sand paper provides a consistent, brushed look. *All Chroma panels come standard with a saw cut edge finish. Eased Edge - A soft, very subtle bevel. Chamfer Edge - For a distinct design choice. 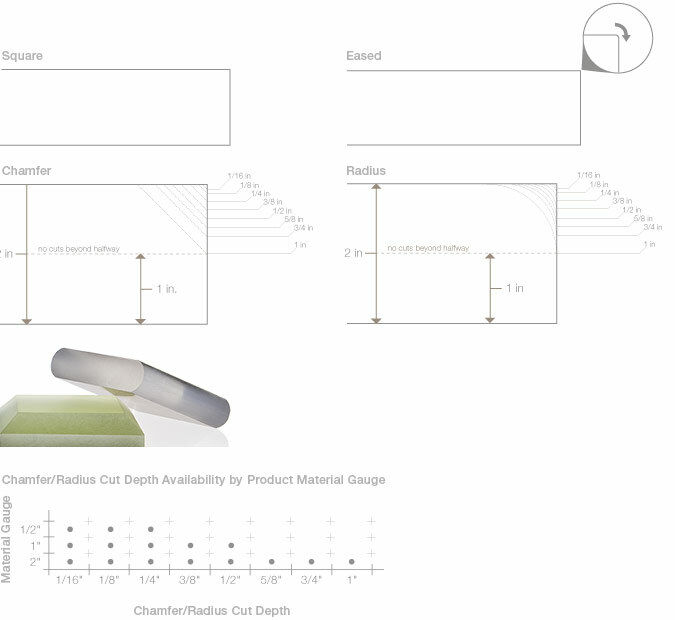 Radius Edge - For a smooth, rounded edge. *All Chroma panels come standard with square/sharp edges. In an installation where multiple panels need to be pieced together to form larger installations, such as long counters, Chroma can be joined using our structural seams. Light seams are a choice option for box-like applications like light boxes, showcase boxes, planters, countertop dropdown ledges and aprons, and return-to-wall panels. form Chroma can be formed into simple, linear curves. Gently formed Chroma is ideal for receptionist and welcoming areas. Etch lettering or a logo into the surface of Chroma. This service combines the usefulness of signage with the design factor of Chroma color luminosity to make a memorable impression. CNC etching + sandblasting to create a beautiful frosted look. Interior only. CNC + sandblasting + painting to create a colored depth perception through text or logos. Laser etching. Our laser can etch Chroma to create a white frosted background. The precision of the laser also creates nice sharp inside corners that a CNC cannot achieve. 3form has created a field seam kit that makes seaming our Chroma materials onsite a very simple process. Our kit comes with fully detailed instructions, tools, and adhesive to seam onsite and can be reused again and again. *Field seam prep is recommended for field seam to assure proper fitting and bonding in the field. For installations where panel edges are exposed, 100 Percent offers an additional edge option. Sanded Edge Finish - 220 grit sand paper provides a consistent, brushed look. When using 100 Percent in horizontal surfaces such as table tops or bar tops, consider 3form's edge detail options. Tongue and Groove Joint - For applications where horizontal and vertical edges meet. This joint is available only with color seam. Tongue and Groove Reveal Joint - a structural option with a distinct aesthetic. Angled seams are a choice option for box-like applications such as light boxes, showcase boxes, planters, countertop dropdown ledges, and return-to-wall panels. 100 Percent requires the following two-angled joinery. Mitered Joint - For a clean and simple aesthetic. Tongue and Groove Joint - For applications needing solid, structural support. 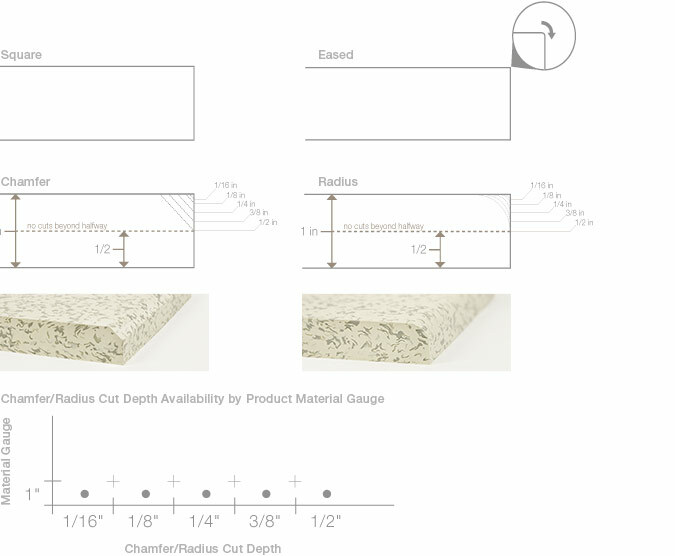 Edge details are available when using Stone in horizontal surfaces such as table tops or bar tops. Tongue and Groove Joint - for strong structural support. Angled seams are a choice option for box-like applications such as light boxes, showcase boxes, planters, countertop dropdown ledges, and return-to-wall panels. 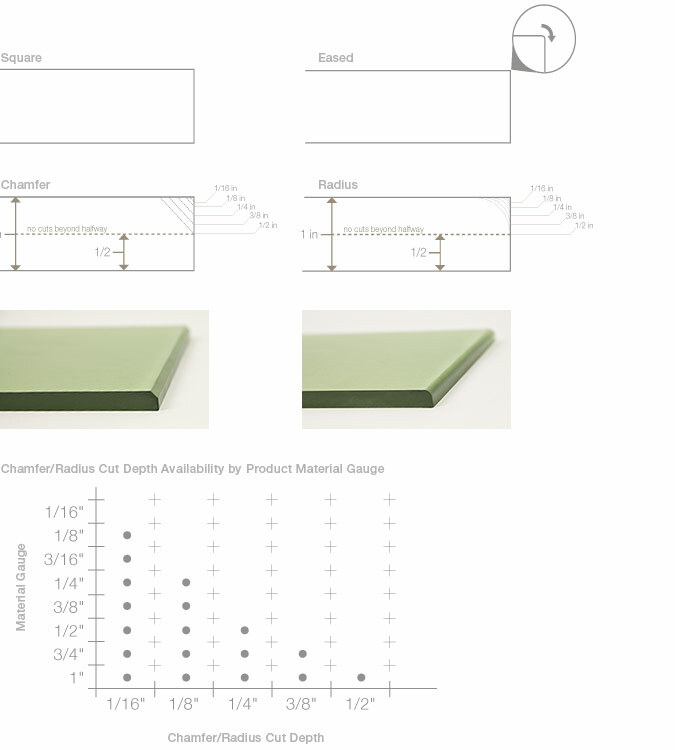 Edge detail options are available when using Fizz, Float Large, Float Small or Pep in horizontal surfaces such as benches, in vertical solutions such as restroom doors, or in an installation where the product core cannot be exposed. Choose to seal an edge with four different solutions. All color capped edge options offer a capped edge in matching color with the Struttura panel. There are three options offering distinct features. Color-Capped Outset Radiused Edge - A color capped edge with 1/8th inch radius for a subtle bullnose edge. Color layer is outset from panel perimeter creating a clear band around panel edge. Color-Capped Outset Edge - As sophisticated as radius option, with an eased edge. This option is also outset, offering a smooth clear band around the perimeter of the panel. Slightly more cost-effective than Color Capped Outset Radiused Edge. Color-Capped Inset Color Edge - Color is inset within the perimeter of the panel creating a consistent color appearance and no clear band. This is the most cost-effective option. 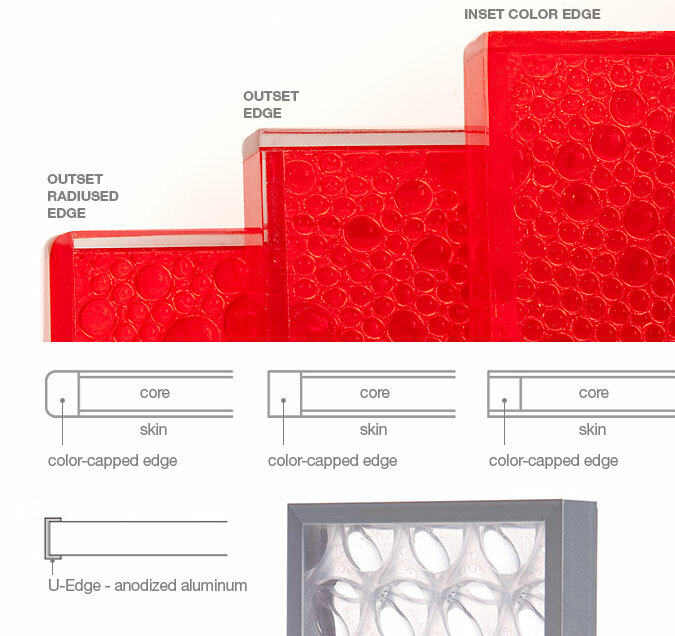 An anodized aluminum solution; provides a cap to surround the edge entirely. Struttura can be formed using a line bend technique to create three-dimensional installations.